MakeMyTrip Ltd, the parent company of MakeMyTrip (India) Pvt Ltd and makemytrip.com, on Thursday fixed the price of its initial public offer at $14 per share. India's largest travel portal, which is selling 5,000,000 ordinary shares through an IPO, got listed on the Nasdaq on Thursday. At $14 a share, MakeMyTrip would be valued at $478 million (Rs 2,236 crore), or five times recent sales. Analysts said that's expensive relative to Expedia, a little higher than Priceline.com, but cheap compared to Ctrip, the Chinese travel portal which made a debut in 2003. Thursday, Ctrip is worth $5.4 billion or 17 times trailing 12-month sales, wrote Tim Mullaney in a recent column on Reuters' Breakingviews.com, which appears in Business Standard Monday to Saturday. If MakeMyTrip can close even a portion of the gap with its Chinese counterpart, shareholders will be in for a profitable journey, wrote Mullaney. The portal earns the bulk of its revenues by selling air tickets; it also sells hotel rooms and travel packages. It achieved revenue of $83.6 million in the year ending this March and posted positive operating cash flow, but a net loss of $6.2 million. It managed to bring down losses from $18.9 million two years before. Close to a third of the stock is being sold by existing shareholders, including venture capitalists and chief executive officer Deep Kalra. Of the total offering, 3,846,154 ordinary shares are being offered by the company, while 1,153,846 ordinary shares are being offered by certain selling shareholders. In connection with the offering, the company and some of the selling shareholders have granted to the underwriters an option to purchase up to an additional 750,000 ordinary shares to cover over-allotments. 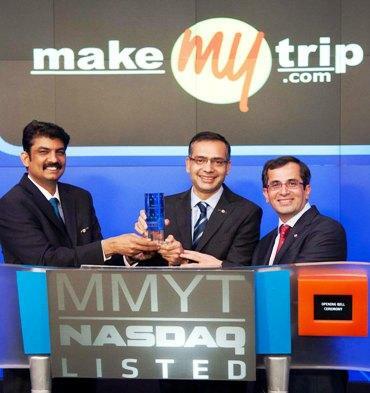 MakeMyTrip Ltd has stated it intends to use the net proceeds from sale of the ordinary shares by the company to expand its operations, by acquiring or investing in strategic businesses or assets that complement the company's service and product offerings, and to invest in enhancements to its technology, and for working capital and other general corporate purposes. Morgan Stanley was the sole book running manager of the offering and Oppenheimer & Co Inc and Pacific Crest Securities LLC were co-managers, the travel portal said in a statement issued on Thursday. Ten years ago, while he was working with GE Capital in Delhi, Deep Kalra would often book hotel rooms on the internet. Once planning a holiday to Thailand, Kalra bought top-class rooms for $110 a night as against the tariff of $150 available offline. The realisation of the power of the Internet made Kalra quit his job as vice-president (business development). Inspired by Ajit Balakrishnan of rediff.com and Sanjeev Bikhchandani of Naukri.com, he roped in a few friends and floated makemytrip.com. But it was not a big, novel idea. There were 20 other travel portals, like Net2travel, Traveljini and Travelmartindia, jostling for a pie of the travel mart. While many of these travel portals have closed down or are struggling to survive, MMT has made it big. Its success attracted others like Cleartrip and Yatra, and global majors like Expedia and Travelocity, which have not been able to make much headway here. MMT, which commands 40 per cent share of the online travel space in the country, is in the news for its plan to raise $100 million (Rs 462.95 crore today) through an initial public offer on the Nasdaq -- a move which is being watched keenly by online travel agents and venture capitalists which have funded travel portals. Profits have proved to be elusive so far, despite a decade-long existence. MMT has, however brought losses down to $6.3 million (Rs 29.18 crore today) in 2009-10 from $18.9 million (Rs 87.50 crore today) two years back. The portal achieved sales of Rs 2,200 crore (Rs 22 billion) for the year ended March 2010. "It has managed to build volumes of customers and a steady turnover. "It has demonstrated that there's a market for online travel," says Ashwini Kakkar, vice-chairman, Mercury Travels, who has been associated with a couple of such portals. Kalra is in the US with his top team for the IPO. He was not available for comment, but MMT has disclosed in its offer document that but for the effects of employee share-based compensation costs, it would have recorded an operating loss of $10.2 million (Rs 47.24 crore) in 2008-09 and an operating profit of $0.8 million (Rs 3.7 crore) in the financial year 2009-10. Image: (L-R) Rajesh Magow, co-founder/CFO, Deep Kalra, co-founder/CEO, Keyur Joshi, co-founder/COO. Analysts say the industry allows one to make money and some global portals like C-trip, Expedia and priceline.com enjoy healthy operating margins of 30 per cent or thereabouts. Sandeep Murthy, partner, Sherpalo Ventures, a company which has invested in cleartrip.com, is happy that MMT is going public. "It's a good time to list their business. What's better is it is listing in the US, which has a well-educated group of investors (who have invested in travel portals). If they are successful, it will increase the profile of the business and bring more customers to portals," says Murthy, who's also the CEO of cleartrip.com. Not content with a head-start over rivals like Yatra and Cleartip, MMT has consolidated its position by adding products like hotels and packages, bus and train bookings, car rentals, and, most importantly, by extending its physical reach. Travel portals have been constrained by the limited reach of the Internet, broadband and credit cards in the country. For instance, 13 million people have access to the internet, 7.5 million have broadband access and there were 19.02 million credit cards issued till 2009. Customers still do not feel secure buying holidays online. To overcome this, MMT has opened 20 offices and several stores across the country, which, it believes, are an extension of its online presence. "MMT's offline retail strategy and focus on holidays last year has worked well for it. "The retail strategy has given it a leg-up by opening up a wider market. It gives access to a customer base it was not getting earlier," says Dhruv Shringi, CEO, Yatra. This also allows MMT to distribute its customer acquisition spends better. Image: (L-R) Rajesh Magow,co-founder/CFO, Deep Kalra, co-founder/CEO, Keyur Joshi, co-founder/COO. Makemytrip's journey has not been without hiccups. Kalra had initially assumed, like everyone else, that the Indian market would constitute half his business, with inbound-traffic through NRIs bringing in the other half. "The message was loud and clear: The Indian market was not ready; no one was buying. So we focused on the inbound and became profitable," Kalra had said earlier. NRIs were making close to a million trips to India every year, which made it a $1.2 billion market. Though his fares were more expensive than local consolidators in the US, he could seed the market by harping on service (no travel agent in the US works on weekends; MMT was available round the clock). MMT leveraged the BPO model by taking the call to India and servicing the customer cheaper. The entry of low-cost carriers in India offered fliers choice and lower fares, opening up the Indian online travel market. To be sure, the Indian travel market is not as robust as the one in the US or in China. Yet, it is a $20 billion market. "We are not even close to an inflection point, and still we are building real revenues, real earnings and some scale. The market could explode if connectivity improves, PC or smart phone prices drop," says Murthy. The situation in the travel portal industry is similar to where the telecom industry was in 2005, when there were just 50 million subscribers and growth was linear. The projections till 2004 never exceeded 150 million users. With serious players like Reliance Industries getting into the broadband game, the country may soon have faster data networks that could drive internet penetration. Besides, with phones getting better and cheaper, for many their first interaction with the internet could be through their smart phones. "India is not a game you can play for today. You have to be in it for the long term. "You can build a profitable business and some scale and wait till there's an inflection point, which you can take advantage of," says Murthy. Someone like Bharti Enterprises did just that. 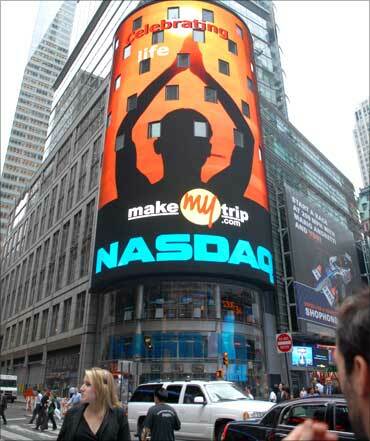 Image: MakeMyTrip celebrates after listing on Nasdaq. MakeMyTrip finds itself in rough weather, with Ezeego.com, a group company of Cox and Kings and a competitor in the online travel segment, initiating legal proceedings against it. Cox and Kings has also written a letter to the US Securities and Exchange Commission on August 5, highlighting MMT's failure to disclose in its registration statement the existence of criminal proceedings currently pending against the company in India. SEC hasn't replied to the letter yet. Ezeego.com has alleged MMT registered domain names similar to its Ezeego1.com, in 2007-08. Cox and Kings Ltd has a 14.98 per cent stake in Ezeego1.com and the latter is seeking compensation of $15-20 million from MMT. The criminal proceedings initiated by Ezeego1.com, among others, are for violations of the India Trade Mark Act, 1999 and are currently pending before the additional chief metropolitan magistrate, 37th Court, at Esplanade, Mumbai. Peter Lobo, Legal Consul for Ezeego1.com, said: "Ezeego1.com spent close to Rs 33 crore in advertising for popularising its domain name. "When MakeMyTrip registered deceptively similar domain names, they not only diverted Ezeego1.com's user traffic of up to 10-20 million hits, but also gained undue advantage due to the popularity of the domain as a result of the advertising by the complainant." 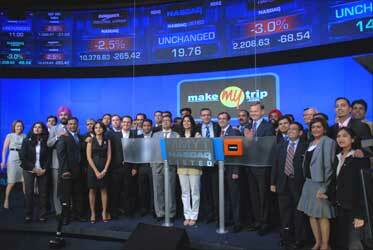 On Friday, MakeMyTrip saw its market valuation nearly double to $902.8 million on its debut trade in the US market. The shares of the company shot-up by 88.93 per cent over the IPO price of $ 14 a piece. 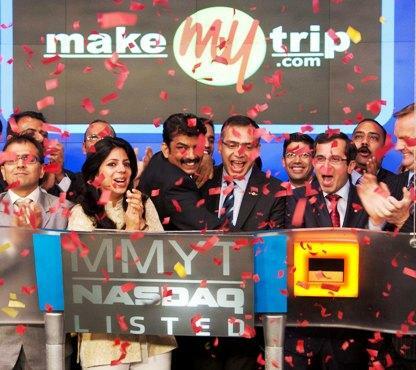 MakeMyTrip that raised $70 million through its maiden initial public offering of 5 million shares in the US market ended its first day of trade at $26.45 per share. On closing price, the Gurgaon-based company is valued worth $902.84 million in contrast to its valuation of $477.87 million just a day earlier. Analysts said the 'stellar debut' of MakeMyTrip was an encouraging event for many Indian firms, planning a listing in the US. 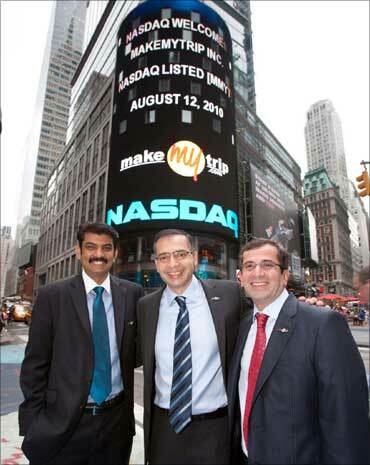 Image: Team MakeMyTrip poses with Nasdaq officials. Bye, bye, malaria? Solar mosquito trapper is here!